Unfortunately, it wasn't good as I hoped. If i'm being honest, I don't even know why I picked it up because I usually don't read steampunk.. oh wells. 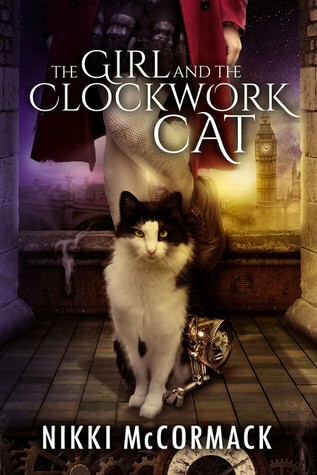 The story is centred in London with a "street rat", Maeko (half Japanese), who gets sucked into this mystery revolving around a cat with a clockwork leg. Interesting? Mehhh.. The mystery was a bit laggy. It didn't really feel like a mystery either... Just some gal and an attempt at a love triangle, running around places trying not to get caught. I was bored at times, and had to really push myself to carry on till the end. (*cough* That's why it took ages to finish this..) It wasn't like the "I can't continue on for the life of me, please kill me now" feeling though. Some parts were actually decent. Just I think the general story could have been improved. Seriously, the love triangle just didn't make sense in this one. A plain one to one could have done fine! Just because most YA books have triangles these days, there is NO NEED to grab a random male character and stick it in a love interest position :/ It's like... Ash's interest was believable. Sorta. But the second guy, Chaff, has been her mentor of how to survive since she was really young. They have a special bond.. and then *DUN* Ash comes in. Chaff gets jealous. He turns into a mentor/friend/family to 'love interest' overnight. The writing was cool, I must admit! McCormack did a good job portraying historic London ^.^ Well the language anyways. I didn't really read much about the setting.. maybe she thought "Hmm where shall this scene be set... Pffft. London language, steampunk, yeah. The readers will know where the characters are right now. Just some random place in London. *shrugs and continues with story*"
Oh, and since mine is an ARC copy, I hope they proofread this before publishing xD McCormack slipped up and used "mom" twice near the end.. *looks around for editor* HELLOOO? The ending was terrible! and not in a good way. I recently (as mentioned above) found out this was a standalone? From Lola's review? Sigh.. This was a big mistake :/ I hope the author really changes this decision. You can't leave a standalone in a cliffhanger, unless you're planning on finishing it. Overall, it was a bit of a easily forgettable read with a dragging on mystery (ish) and characters that didn't stand out (notice I haven't said much about them. Ain't really anything to say..) , an unnecessary love triangle, and a confusing plot. Should really be a sequel even if I won't read it, and i'm immensely glad I managed to finish it.